Discover clients like yours who have found success with Tagkast. Subaru invests in event marketing and sponsorship to support the passions of their consumers, associate with positive life experiences, and boost brand engagement. Tagkast helped Subaru interact with more mud run attendees, and then inspired them to share their personal brand experiences as social endorsements with their own social media networks. Hall Pass Media implemented Tagkast for the 2014 NBA Summer League events to increase live fan engagement and leverage the on-site fans into brand evangelists by helping them share their experiences with their own social media networks. Ultimately, Tagkast increased the NBA Summer League’s ROI by generating word-of-mouth recommendations on social media that drove targeted web traffic and ticket sales directly from the event marketing program. The ADA’s experiential initiatives exist to support fundraising and raise awareness for their organization. 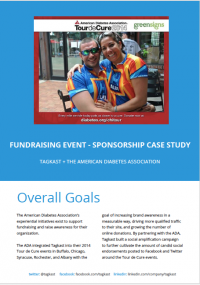 The organization integrated Tagkast into their 2014 Tour de Cure events with the goal of increasing brand awareness in a measurable way, driving more qualified traffic to their site, and growing the number of online donations for the Tour de Cure. Pandora sponsors events to boost brand awareness and further engage their target audience. Tagkast helped Pandora socially amplify their concert sponsorships and engage consumers beyond physical event barriers in a very targeted way. Using Tagkast, Pandora was able to tap into the social audiences of event attendees to reach an entirely new market through word-of-mouth social endorsements.